Wes Healey (Bradley) is an ex-Marine who travels to Indonesia while on the hunt for his old buddy Keith Stone (Zags). Healey wants answers about the death of a mutual friend, and while in this foreign land, he stays at the palatial estate of Keith’s sister Karen (Campbell). However, it transpires that Keith is a megalomaniacal, unstable nutjob who has corraled some locals into becoming his own personal fighting force. He even demands they train in front of him while he watches them beat the living snot out of each other, for his own amusement, of course. When Healey rejects all the madness, Stone turns on him, and he has to save Karen and fight a bunch of goons. This, of course, leads to the final confrontation between Healey and Stone. And who exactly are the BLOOD WARRIORS here? Huh? What? Oh, we’re supposed to review Blood Warriors. I’m sorry, our eyelids were getting heavy. You’d think - you’d REALLY think - a movie starring David Bradley and Frank Zagarino, directed by Firstenberg, would be a no-brainer winner. Well...not so much. It’s almost like they came up with the title first, but worked backwards - in the wrong direction. 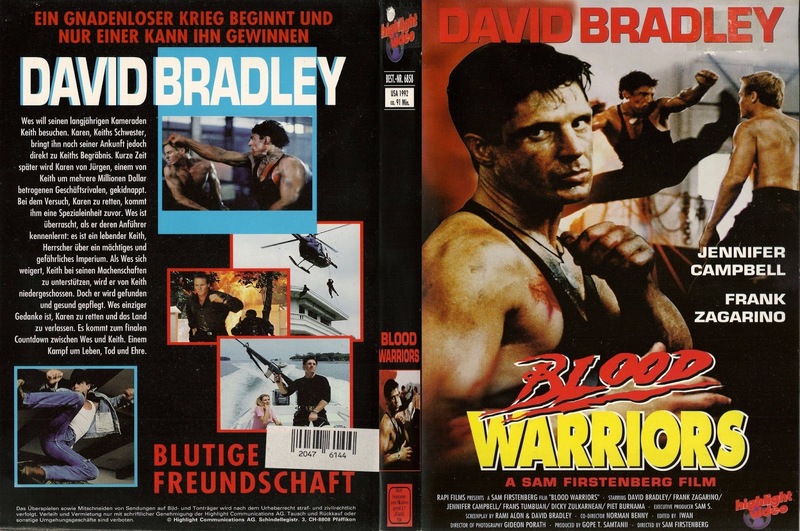 Here’s a conversation that probably happened: “I’ve got a great title for a movie!” “Oh, what is it?” “Blood Warriors.” “Yeah, that is good! Now what happens?” “Eh, I don’t know...” Basing our thoughts off of this supposition, we noticed that the whole movie’s vibe is just off. It’s like the rhythm of it all is wrong - it gets off on the wrong foot and struggles to recover for the rest of the running time. Now that’s not to say that there aren’t a plethora of unintentionally funny moments. Blood Warriors is like watching a heart monitor for someone struggling to live: for a long period of time there’s a flatline, but then out of nowhere a few spikes will shoot up, then it will go back down. The movie was co-written by Bradley, which may explain why he speaks in a tightly controlled rasp, wears a black cowboy hat that makes him look like country music star Clint Black, and can jump in slow motion off buildings and cars, and essentially slow down time and space at his will so he can fight nameless goons and shoot them. He also picks up a guitar at one point and begins serenading Karen. A crooning David Bradley. Now we’ve seen everything. Everything about this movie screams “stereotypical stupid”. From the funny/dumb action scenes on down, from the Prerequisite Torture (this time not of the hero, but of Karen), to the boat chase. Said boat chase features music on the soundtrack that can only be described as “90’s Chase Rock.” Anyone who’s ever seen an action movie from this time period knows what we’re talking about - generic rock with distorted guitars and squealing, wailing guitar solos. Naturally, it all caps off with the time-honored warehouse fight. But the whole outing is slow - Zagarino doesn’t even show up until 50 minutes into the movie even though he’s second-billed. We were on "Zag-watch". Blood Warriors drags for much of the proceedings and should have been chopped by about 10 minutes or so. Then we’d have something. Yes, there are some occasionally funny moments that pop up in Blood Warriors, but is that what we’re watching these movies for? If you have some time on your hands and you don’t mind waiting to have a few yuks, by all means go ahead, but on the whole it’s a disappointment. I thought this film was pretty good, one of Bradley's better efforts overall. Have to disagree. Hard Justice blows this one away. As a HUGE fan of Sam Firstenberg's work (hence the screen name), I am shocked to see a movie he directed with Bradley not on the Cannon label. This seems to have all the hallmarks of a decent direct to video film: semi-famous martial arts lead, semi-well known baddie, respected genre director, recognizable plot ... but I'm sorry to hear that it crashed and burned. I can guarantee you that if I were perusing the local video store in 1993 and came across this, I'd plunk down $2 to rent it. Have you seen American Samurai? I think Firstenberg also directed it (with Bradley starring). It's like Bloodsport with weapons. I have to agree with venom on this one. It has pacing problems, nothing happens in the first half-hour, but the rest is solid action. Joe: Thanks! Appreciate it. We have seen and reviewed American Samurai. 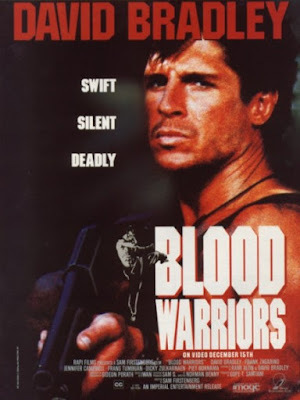 As far as Blood Warriors, this is a perfect 2 dollar movie. Roger: The best part of the movie is when David Bradley defies gravity. We agree on that much.